We picked up a friend and headed out for Anambah, a suburb bordered by the Hunter River on the outskirts of Maitland. The farm we are visiting sits on the boundary between city and country. A brand new 'homemakers' center sits next door, Maitland airport is their other neighbour. A housing estate is slowly enveloping the surrounding hills. We spot the sign: Purple Pear Organics. Rolling up the tree lined drive we a are greeted by a flock of white geese patrolling the yard. Today's classroom is a large open shed, the walls adorned with farming implements and tools, already bustling with members of the Hunter Organic Growers Society (HOGS). Each seated in their fold up chairs, hats on heads and gardening gloves at the ready. The sun casts a welcome warmth below the tin roof. HOGS have organised today's workshop on seed raising with our hosts Kate and Mark, the entrepreneurs behind this successful example of community assisted agriculture (CSA). CSA puts the consumer in direct contact with the producer. Subscribers have an opportunity to know where their food comes from, how it is grown, and who grows it. Mark tells us that they feed 20 families who each commit to a weekly box of produce from the farm. They don't like waste. By selling their produce before they grow it they know precisely what quantity they need to produce. This model seems to share the gluts and losses more equitably. This season they received a poor batch of onion seeds. 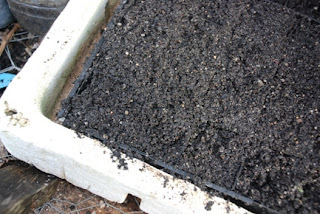 None germinated, therefore, Kate laments, no one will receive onions this winter. But things must weigh out, as they have a long waiting list of families and are planning to more than double their production very soon. A light plane circles into land, disappearing below the horizon. We head for the mandala garden. Kate is the farm's seed raiser. It's cheaper than buying seedlings she tells us. Mark mentions the challenges of reaping a profitable income from their small scale operation, despite selling direct to the consumer. For the economics to be at the ideal, Kate would need to sow seeds at some incredible speed. I wonder at how much large scale farming operations play a role in pushing small farms out of the market. Not to mention the ongoing saga of the supermarket price wars. Being in the sunshine on a winters day makes for a rather nice office, but it's still a business, the economics need to be managed carefully. Alternatively use empty toilet roles. 4. Fill with seedling mix. have emerged and plant one into each tube. 7. Store in a green/glasshouse or protected area with adequate sun. 8. 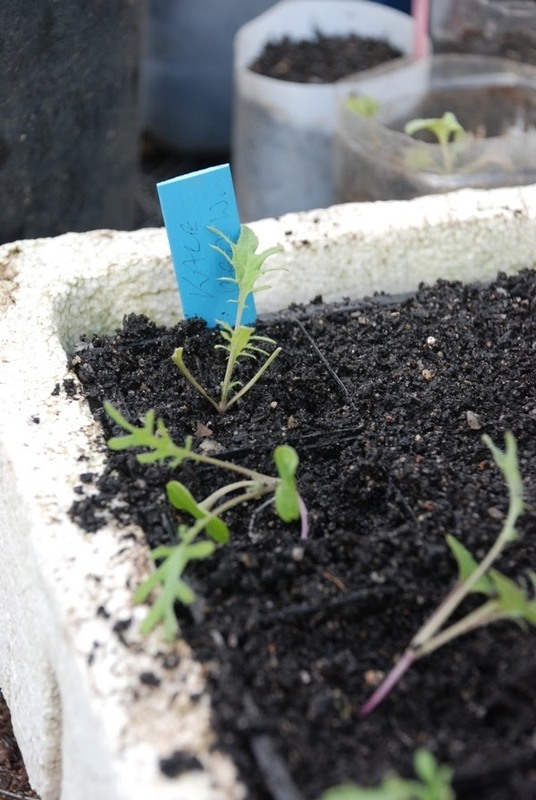 When plants reach around 10 - 15 cm high, place outside to harden up for a few days,then plant into your garden. 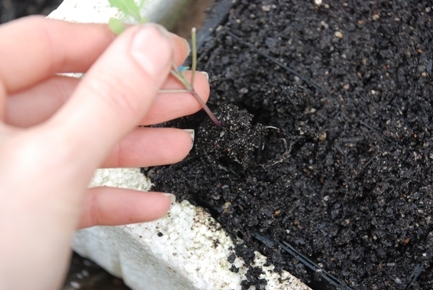 A few volunteers start the fiddly task of prying apart seedlings from a tangle of roots and planting into the trays. I nip away quickly to the loo, which is an experience in itself. Beside the shed sits a white box, a mismatch of recycled building materials, propped up on stilts. The handle is a knotted rope threaded through the door that slots between two nails on the door frame to hold it to. Inside, I peer into the bowl. I don't make a habit of inspecting toilets with such attention, however this one has caught my eye as it works somewhat differently to the familiar dual flush. There is a deep dark hole at the back as one would expect with a compost toilet. At the front end there is a little white dish with a drain in the middle, like a miniature handbasin. 'Liquids, solids.' I think. As a female, I have had never had to consider my aim before. On my return my partner tells me that there was a mid air dual between two large birds of prey. I gaze at the sky where the winner remains circling. The bird has a large wing span, perhaps close to two meters. They had broken apart before hitting the ground. Kate gestures behind her to a bench made of old heavy gauge wire fencing, like those that were once used to fence schools, laid over a frame to create a table. 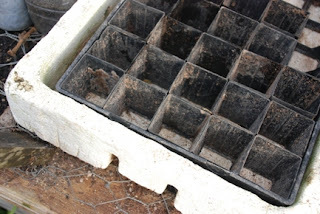 Trays of thriving seedlings lay on top, a net thrown over to keep birds off. This is the holding pen where seedlings spend a day or two to harden up to the elements before graduating to the vegetable beds. Below the table peck a few chooks enclosed in a pen to keep the grass down. The structure serves two purposes, a classic permaculture principal in action. Mandala is a Sanskrit word meaning circle. The term often refers to concentric diagrams common in Buddhist and Hindu art. The mandala as a garden layout (see my earlier post Mandala Chook Clock Garden) has been popularised amongst permaculture enthusiasts by Linda Woodrow's book 'The Permaculture Home Garden' where a series of circular beds placed within a larger circle form the design. Purple Pear's market garden resembles Woodrow's system being a series of mandalas within mandalas, dotted with small fruit trees and central ponds that attract beneficial wildlife. Wandering down the narrow paths that weave gently through the garden, spongy underfoot, I find myself somewhat pleasantly disoriented, but I go with the flow. We are presented with a recently planted circular bed, chock full of some 200 or so seedlings in an approximately 2 - 3 meter diameter bed. The key to gardening efficiently in this design, Mark explains, is that a large vegetable such as a cabbage, will be planted in the middle of a patch of fast growing plants, such as salad greens. By the time the cabbage encroaches on the smaller plants, these plants will have been harvested, leaving room for the cabbage to expand. Kate affirms the importance of this simple design element as a key part of the system. I feel heartened to notice patches of clover and chick weed fringing the vegetable beds. By comparison, I feel the inevitable weeds in my garden aren't so bad after all. There is a glimmer of a smile on Mark's face as he mentions that his chook dome is in need of a few repairs, and therefore requires a few extra hands to move it to the next bed. It just so happens that today there a plenty of willing hands. Six or so people circle the dome and grip the edge of the frame, slowly walking it to an adjacent bed. The moulting crew of chooks within stay under the dome as it moves. The chooks new bed is piled high with mulch and spent plants. They get straight into scratching it over with their powerful legs. The domes are made according to Woodrow's method. Approximately 1.5 - 2m in height, and the width of the mandala beds. The frame is a network of black and white flexible piping (I assume another useful tip find), covered in chicken wire with a tarp on top to weather proof it. A mower catcher makes for a nesting box. When a crop is harvested the chooks are moved onto the bed to weed and fertilise it in preparation for the next crop. Permaculture in action. Seated in the 'classroom', the last crumbs of afternoon tea are brushed away. Photo copies of a calendar of June are passed around. I note the little cow symbols dotted across the page. Contented cows sitting down chewing the cud. This is a moon calender. Mark explains there are several different approaches to planting by the moon, but which ever works for you is the one you should choose. He recounts an evening upon which they hosted Lyn Bagnall in preparation for the launch of her book 'Easy Organic Gardening & Moon Planting' to be held at the farm the next day. It was an evening of heated discussion over the merits of their differing methods of moon gardening. However, Mark re-affirms, which ever method works for you. Across the page are the days of the month. Running in a column below each day is a picture of the moon phase, today it is waning, and the zodiac that the moon is currently in front of which informs the daily plant focus. Today there is a picture of a tomatoe, meaning it is a fruit day, therefore all planting and harvest activities today should involve fruits such as apples or melons. A graph shows the position of the moon in the sky: whether it sits high or low in relation to the horizon. Today it is descending and nearly at its lowest point in the sky. The moon effects a pull on the earth, Mark tells us, which we can observe in the tides of the oceans. This pull of the moon also affects flows within living things. In plants the sap flow will rise as the moon ascends, and descend to the roots as the moon lowers in rhythm with the monthly pattern. Seasonally there is a similar effect, in Winter energy tends to move inwards, to conserve, in Spring and Summer energy moves out to the periphery. These rhythms can impact the success of germination, pruning, fertilising and other activities in the garden. I gaze out beside the shed, a little boy is befriending the resident tabby cat. He motions for the cat to follow him. The cat decides that eating the crumbs off my partner's feet is a more lucrative option. Moon planting is a way of getting in tune with natures rhythms and utilising these to promote optimum plant growth. 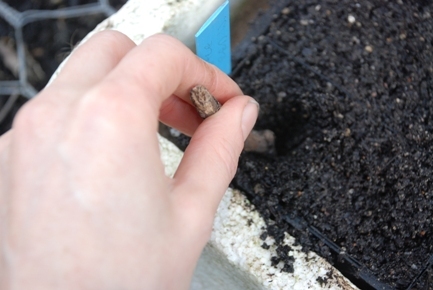 By undertaking particular activities at certain times, such as pruning in winter when a plant is dormant, and ideally when the moon is descending, then the sap flow will be directed towards the roots, reducing the stress on the plant. Once you develop a feel for working with nature, Mark's experience is that you'll discover a sense for knowing what needs to be done on each day without looking at the calender. I am still not sure what the cows are for, but they look happy, if that can be a testament for moon planting. In all seriousness, the thriving garden at Purple Pear is surely a testament to Mark and Kate's application of permacuture and biodynamics as systems that produce fantastic results. As we turn out of the farm-gate I take another look at the houses creeping over the hill, the cusp of development. I think how appropriate a location for a farm that aims to close the gap between farmer and consumer. Thank you to Kate and Mark for sharing their knowledge and to Hunter Organic Growers Society (www.hunterorganicgrowerssociety.org.au) for organising the day. To learn more about Purple Pear please visit their website www.purplepear.net.au. Moon Calenders are available for sale from Holistic Page. Loved this Michelle! We often buy our veg through a similar program called Food Connect in Brisbane. You might like to check them out www.foodconnect.com.au.